I had the pleasure of photographing an Eagle Court of Honor this afternoon. It's a rare event because statistically only 2% of all Boy Scouts attain the highest rank of Eagle Scout. Spencer Critchfield is a special young man. He's funny, likeable by everyone, young and old. He exemplifies the true meaning of Scouting. There were so many who made a brief speech to describe Spencer. I was in awe with so many people, one after another spoke so highly and positively of him. His Mom, Chris is such a energetic and happy lady. It's no wonder that Spencer attained Eagle rank. It's definitely with the support of his Mom, and various members of his family. Spencer is definitely a blessed young man to be surrounded by so many who love him. Toward the end of Spencer's thank you speech, he got a little teary eye as he thanked everyone in the room because they have affected him in a positive way throughout his youth and through his journey in Scouting. 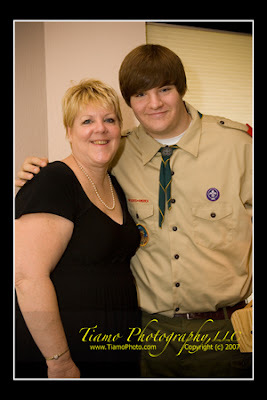 And if you read my previous blog entry (March 3, 2006), I've been a Boy Scout Leader for the past 17 years. 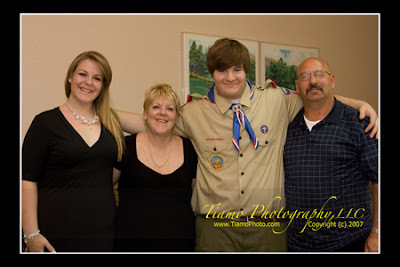 Naturally, I showed to this event with my Boy Scout uniform and I blended into the event perfectly. 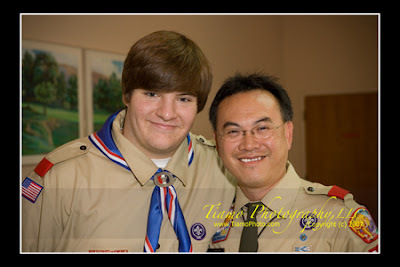 Spencer, Congratulations on your Eagle Rank. It was a tough journey, but you deserve it. And Chris, you did a magnificent job supporting Spencer throughout his Scouting career. Congratulations to you both.